Hello and welcome to today's live chat on 2013's best new car values! Hi everyone, glad you could join us! This year, Jessica sorted through a record number of cars -- 1,693 to be exact. So, she should have plenty of great answers for those of you in the market for a new car. Jessica, to get us started, can you tell us what separates 2013’s batch of new cars from 2012? The biggest thing is, there’s so much more technology, both safety and infotainment, that’s being added as standard equipment. In anticipation of federal mandates many more manufacturers are adding rearview cameras as a standard feature and new and redesigned models are getting more airbags across the price spectrum. It’s gotten to the point where you have entry level Chevy products that have more airbags than BMWs. Wow, very interesting. Good news for the consumer though. It's great news--you're getting more for your money than ever before. Great. Well, while we're on the topic of all the new bells and whistles that come with 2013's new models, let's take our first question from Kate. My dad just got a new Ford Escape (he was very proud that he bought an American car). I've driven it with him a number of times now, but I've noticed that some of the new, "easy to use" features are sometimes quite confusing. It beeps anytime his car gets near something even if he's in no danger of hitting it, and often beeps or blinks for no reason at all. Will all new cars be like this in the future? I actually find it quite annoying. As more sensors are added to vehicles, especially those for proximity--those for parking and while driving (for accident prevention), the more beeps you'll have going off. Your dad should be able to adjust some of these settings in his car's menu. If he needs help, the dealer should be able to hook him up. But he should rest easy knowing the Escape is terrific--it's our Best New Small Crossover this year! Here's a follow-up from Kate. Looks like you already helped answer one of her questions. Do you think they'll improve the sensors so that they're not so sensitive? Can you turn them off? Or is this all going to be govn't mandated now? The sensors aren't government mandated...yet! Thanks, Jessica. And good luck, Kate! Jessica, while we're talking about our best in class winners, can you explain how do we rank these? Do you have any favorites? The best winners--best in class and best new models--are all selected by looking at performance, value and safety. The best in class winners are models that have stood the test of time and are our perennial favorites for value. And often something that's a best new pick in the year it's introduced or redesigned (the only thing that separates the two awards) will become a best in class later. That was the case with the Ford Focus this year. 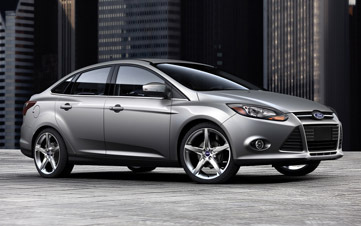 Focus won Best New Car Under $20,000 last year and nabs Best in Class and Best Resale plaudits this year. It’s got a peppy 2.0-liter engine and six airbags come standard. Ford's SYNC system to operate media devices hands-free is $295. 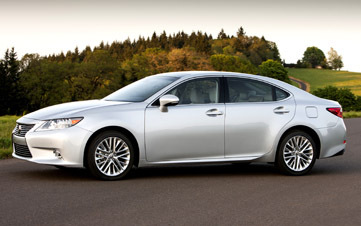 Another one of our perennial favs is Lexus ES 350. Sounds like a great pick! It was redesigned this year, but because it didn't get a new powertrain, we named it a best in class. From the aggressive "spindle" grille to the dual exhaust, the exterior of the ES hints at the sportier character underneath. It gets suspension and steering changes as well as a stiffer body for better feel behind the wheel. So, it's technically not a sports car though? No way...think of it as a really nice Camry...And don't tell Lexus (I'm sure they want you to think it's 100% different)! 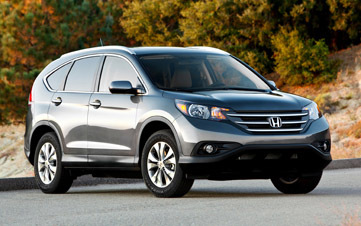 Another Best New turned Best in Class is Honda's CR-V--one of the best selling cars in the country and a definite standout among Small Crossovers. SMS text messaging is standard for compatible smart phones, and reads aloud incoming texts and lets you respond with preset messages. No iPhone yet though...but it's not Honda's fault--Apple wasn't using the same connection system last we checked. One of my favorite things about CR-V is the versatility--the rear seats flip down with the touch of a lever to increase cargo space from 37 to 71 cubic feet! Sounds great, Jessica. Thank you! Let's go ahead and take our next question from C.E.